Strange occurences lead to the realization that several members of the Enterprise crew are being abducted by aliens living in subspace. I love Data's poetry. Some writer had to spend hours coming up with that, and I respect the accomplishment. The opening is unusually mellow. All we are shown is that Riker is tired, but there is no hint of the weirdness beneath it, no hook to get us into the episode. The absence of a hook is almost a hook in and of itself, just because it is so conspicuous. I hate Troi's new haircut. Looks like she's wearing a poodle on her head. The scene on the holodeck is my favorite scene in the episode, but it seems odd that Troi is so confortable with this line of inquiry. From her perspective, she's dealing with four crewmembers who are all reporting vague dream-like memories, and once they start describing them to each other, they all become clearer and more similar to each other. This is exactly what would happen if they were confabulating--forming false memories through the power of suggestion--and Troi should know better than to let it continue in that direction. The table turns into a medical station awfully suddenly, such that it goes from being a table to being something nobody would classify a "table" in just one iteration. 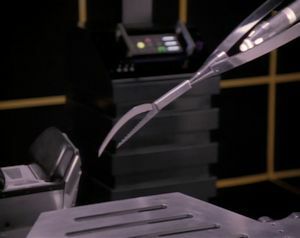 One thing I don't quite understand: La Forge posits that his sensor modification got the attention of the aliens who then proceeded to abduct crewmembers, but at the start of the episode, Riker was already showing signs of fatigue and La Forge had not yet begun his modifications. The crew is awfully blasé about there being an infinite number of subspace domains--of universes within universes. The logical extension of that would be that all experience is meaningless and relative, that existence is pointless. Beyond that, though, they make it sound as though traveling between these universes isn't all that difficult, which means that they are exploring space when it would be much simpler to simply sail the multiple universes of subspace and encounter anything imaginable. So much for space being the final frontier. It's good that things aren't exactly the same in the alien "domain" as they appeared in the holodeck. For one thing, the tables are actual tables, and the clicking sounds are much more involved. If things were identical, it would be illogical, as neither memory nor a quick simulation can be so accurate. How can La Forge scan all of subspace when, as he already explained, it is infinite? Why does Riker wait so long to act? There are a lot of things I like about this episode. It's a puzzle show, very similar to "Clues," and it does a good job setting the tone and atmosphere of creepy mystery. Of course it's a take on alien abduction mythology, which is fun, but the climax is slightly disappointing, mostly because the aliens turn out to be overgrown Jawas. And while it's good to see Riker unraveling a little, there isn't much in the way of character exploration or development, aside from Data's awesome poetry reading at the start of the show.